ServiceTitan was built on a simple idea: help home services contractors build a better business and better life by giving them the tools to grow and be competitive. Strong, personal customer relationships are the crux of the residential services industry. But managing a growing technician force and delivering exceptional customer service can be difficult for a contracting business to execute at scale. 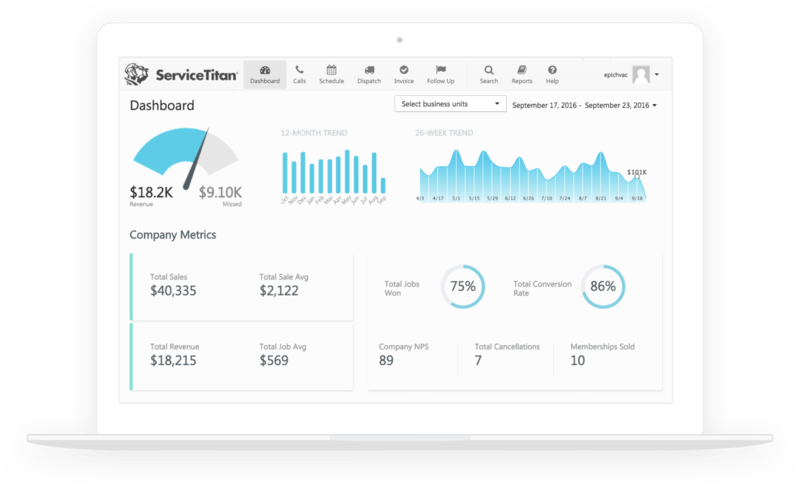 ServiceTitan’s Software as a Service (SaaS) platform was designed to help residential contractors remedy this challenge and scale their business without sacrificing efficiency, communication, customer-centricity or that old-school personal touch. ServiceTitan won the interest of companies in the residential contracting industry, but their marketing and sales model was too manual and disjointed to keep pace. They were attracting site visitors through branded keyword searches, but the volume and quality of their organic traffic was still trailing, suggesting that their content and keyword strategy wasn’t geared to help prospects find their product in relation to persona-specific search queries and challenges. They had an active blog, but were missing top-of-funnel content to organically draw leads to their site and provide value without being too product-centric at this critical first step in the buyer's journey. Additionally, they lacked insight into how lead and customer generation was tied to specific topics and content assets. While brand recognition was drawing site visits and inspiring visitors to convert on demo request forms, their sales team was overwhelmed with too many requests to respond to in a timely manner. Without adequate marketing automation tools and nurture sequences in place, sales reps were ultimately responsible for managing too much of the buyer’s journey. They were left to educate, nurture and qualify leads in addition to establishing first contact and driving a bottom-of-funnel sales conversation. Consequently, their sales funnel was experiencing a bottleneck. Furthermore, contacts that had requested a demo weren't being properly educated and primed for a sales conversation, so the follow-through rate on demo requests wasn't in line with the volume of meetings booked. Of the contacts who attended a sales meeting, too many were disengaging due to a lack of relevant post-call engagement opportunities. In short, ServiceTitan had a superior product and the attention of their industry, but lacked a reliable marketing-to-sales handoff and persona-driven lead generation, qualification and nurture strategy that aligned with each funnel stage. They enlisted New Breed’s help to automate more of the process and align their marketing and sales efforts in support of more qualified organic traffic, landing page conversions and a smoother marketing-to-sales handoff that freed-up sales reps focus on sales-qualified Leads (SQLs). First, we worked with ServiceTitan to define clear buyer personas to inform their content, SEO, nurture, segmentation and qualification strategy. Because we discovered that a residential contracting company’s software needs are inherently tied to the size of their technician force, we agreed to segment ServiceTitan’s four main personas by number of techs as well as by key industry and demographic criteria. In doing so, we were able to align ServiceTitan’s messaging with the needs and challenges of individual personas and create conversion pathways directing leads to resources that would best resonate with their industry and growth stage. 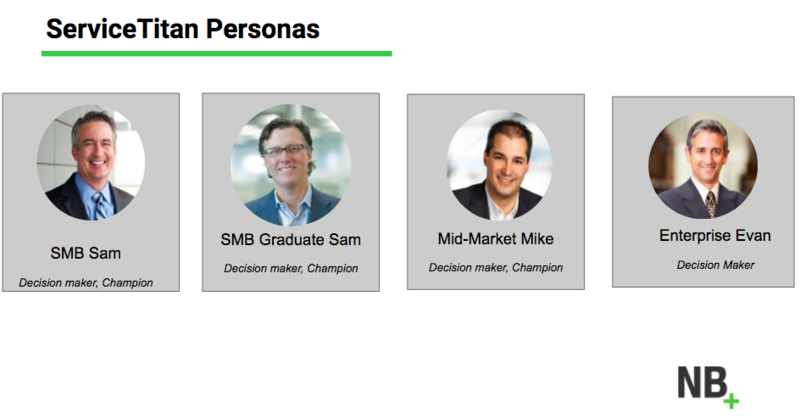 After establishing buyer personas, New Breed conducted keyword research and used that insight to create and optimize content for each persona and lifecycle stage. Top of funnel content was created to bridge their content gap and site copy on industry solutions pages was updated to include keywords and persona-targeted messaging to drive more organic traffic and engagement. Using HubSpot’s Content Strategy tool, we also leveraged personas and keyword insight to create topic clusters for each industry solution page to ensure that site visitors were nurtured with relevant topics and content resources and presented with compelling engagement options. 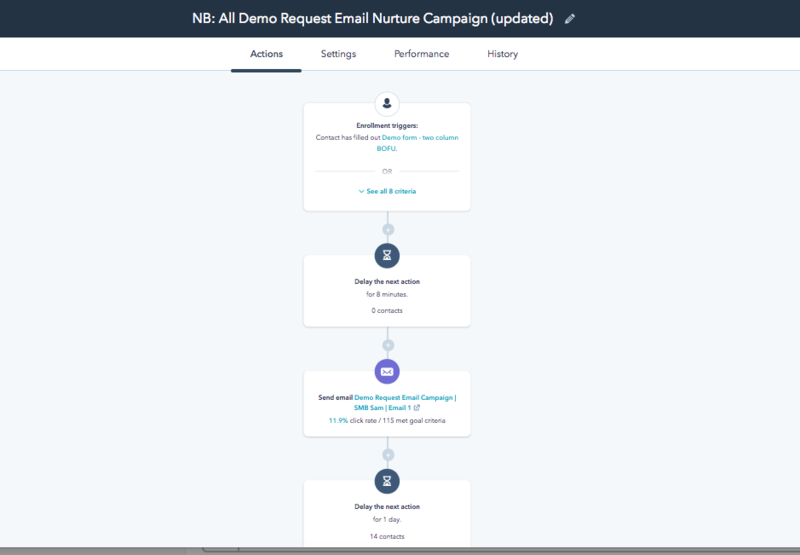 To take some of the burden off of the sales department, New Breed created an automated email nurture campaign in HubSpot around their demo request submission form. The campaign was meant to help educate, nurture and qualify contacts to prime them for a sales call and increase the likelihood that they would follow through with booking a meeting. The sequence was triggered when the contact submitted a demo request form (so sales reps were no longer responsible for manually sending emails and nurturing contacts) and consisted of five emails, spaced at five-day intervals, to give reps a larger time window before reaching out. The demo request email campaign featured middle of funnel (MOFU) content and videos to educate prospects on specific product features and testimonial videos to demonstrate how the product was leveraged by customers to solve different operational challenges. Featured content was segmented by persona and geared toward it's audience's unique pain points and messaging preference. For example, videos featured in emails to the time-strapped Enterprise Evan persona (the buyer persona with the largest tech force) were more product-focused while videos shared with SMB Sam (their small-to-medium sized business persona) were more educational in nature. The choice to leverage video in the email drip campaign was meant to offer busy prospects a quick and easy engagement opportunity to learn more about ServiceTitan and highlight their success with other companies in the HVAC and plumbing sector (ServiceTitan's two main industries). The last email in the nurture sequence also let prospects know that a rep would be reaching out to schedule a meeting, thus establishing a fluid marketing-to-sales handoff process. In addition to creating an email campaign, New Breed updated ServiceTitan's demo request form strategy to better qualify incoming contacts by industry and tech force size. We simplified the industry field options in order to gauge if a prospect should be qualified or disqualified by industry (ServiceTitan focuses on HVAC and plumbing rather than solar and roofing businesses) and made tech size range options align with each of our four established buyer personas. Along with identifying bad-fit leads early on, this form strategy would allow ServiceTitan to serve up more relevant content to prospects based on their industry and growth stage. To increase ServiceTitan's post-call engagement levels and win rates, New Breed created a re-engagement campaign to send to closed/lost contacts that had disengaged after their demo meeting with a sales rep. The email workflow was designed to send 90 days after a deal was marked as closed/lost in the HubSpot database and was sent from the account owner to provide a personal follow-up. The email campaign provides the disengaged contact with links to relevant blog posts and video resources before asking them if the timing is right to schedule another call, thus providing an additional engagement opportunity. To uphold inbound best practices, we also worked with ServiceTitan to create a DQ (disqualification) email workflow series to replace their standalone DQ email. Companies who weren't qualified for a sales reach-out were enrolled in this DQ drip campaign, which focused on providing actionable tips for prospects to grow their business. The sequence was sent at a slower, monthly cadence and was intended to provide value and leave the door open for future contact with ServiceTitan in the event that they became more qualified or a better-fit product offering was created down the line. By honing their content and SEO strategy to be in line with their ideal buyer personas, ServiceTitan increased their new contacts from 477 to 1,374 in January 2018, a 188.05% jump from the previous year. ServiceTitan's blog visits also increased from 807 in December to 1,383 in January, representing a 71% increase in organic traffic. From that traffic, they captured 835 new users in January, compared to 496 in December. Their web sessions increased by 77.32%, suggesting that updated and optimized landing page content was inspiring more sustained engagement along with inciting more site visits. They were able to sustain significant growth in the following month as well, with a 22.4% increase in sessions, 45.2% increase in new contacts and 27.6% more customers. Along with increasing qualified traffic, ServiceTitan's position in search results for top keywords improved significantly. Whereas they previously ranked anywhere from the fifth to seventh page in google search results, they have since achieved a first or second page ranking for their top fifteen keywords. Using HubSpot’s Content Strategy tool, New Breed was also able to help ServiceTitan gain greater insight into lead and customer generation from a topic perspective. We used this information to guide their content strategy in relation to core industries and topic pillars. In addition, they found that people who interacted with the demo request email campaign were 15.8% more likely to move down the funnel than those who didn't. Of those that opened the demo request email campaign, 16.07% moved on to become Sales-Qualified Leads (SQLs). The re-engagement campaign had a 35% open rate (above industry benchmarks) and resulted in 79 prospects re-engaging and raising their hands to contact a sales rep. Twenty-six of those re-engaged prospects have already converted into customers. By automating more of their marketing functions with HubSpot and implementing key email nurture campaigns, ServiceTitan was able to align and streamline their marketing and sales efforts and free-up their sales team to engage with highly-qualified, sales-ready leads (eliminating their bottleneck). In addition, using HubSpot's CRM has offered greater transparency into key performance metrics and helped guide New Breed's strategic approach month-to-month. 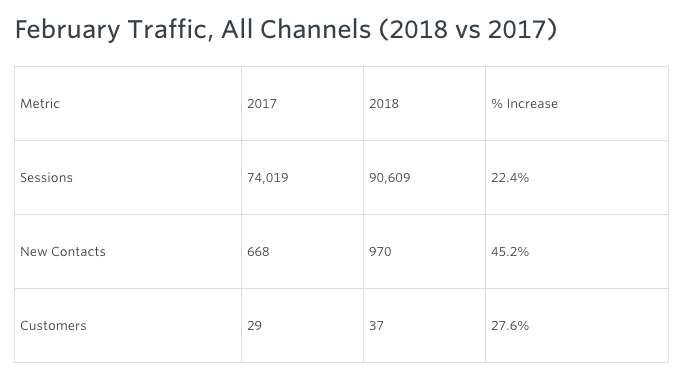 With a persona-driven SEO and content strategy in place, ServiceTitan is seeing a steady increase in organic site traffic, attracting better-fit leads and seeing more of those leads remain engaged throughout their entire buyer's journey. In addition, they've been able to identify content, SEO and strategic gaps in their marketing efforts and respond with highly-targeted campaigns. With more sophisticated reporting and data tracking mechanisms in place, they've been able to connect the dots between their marketing campaigns and sales performance and focus their marketing budget on initiatives that will move the needle on core company goals. In doing so, they've improved their marketing success and built a stronger and more relevant experience for prospects at every stage of the buyer's journey.